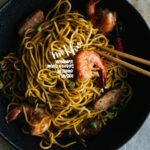 Saucy, sweet, and savory, these dry mixed Vietnamese noodles are loaded with shrimp, sausage, and all the good stuff! I made this traditional Vietnamese noodle dish for Steph and she loved it. I know because she a)went back for seconds and thirds b)said it was better than our restaurant’s version and c)asked for the recipe. Little known fact: she never asks for the recipe unless it’s good, so if she’s asking you for the recipe, you done good. There are three secrets to making really authentic tasting Vietnamese food: how many of the herbs you can find, the brand of fish sauce you use, and a mortar and pestle. In this recipe, there are no herbs, so we’re covered for one, but I’m going to cover the other two. There are maybe as many brands of fish sauce as fish in the ocean. Every Vietnamese family has their own preferred brand, and the right brand can make or break the way your food tastes. In our little family of two, we prefer Red Boat, but my parents much prefer Golden Boy. Growing up, I would hear the regular cadence of my mom’s mortar and pestle going thump thump thump every night as she prepared dinner. My dad never used it, and even he would admit his food didn’t taste as good. He never knew why, but I did; the mortar and pestle is arguably the cornerstone of Vietnamese cuisine. It releases the oils in the aromatics and makes a fresh uncooked-yet-homogenous seasoning paste that you can’t achieve otherwise. You can make this recipe without a mortar and pestle, but you’re losing an easy 20% boost in taste right there. 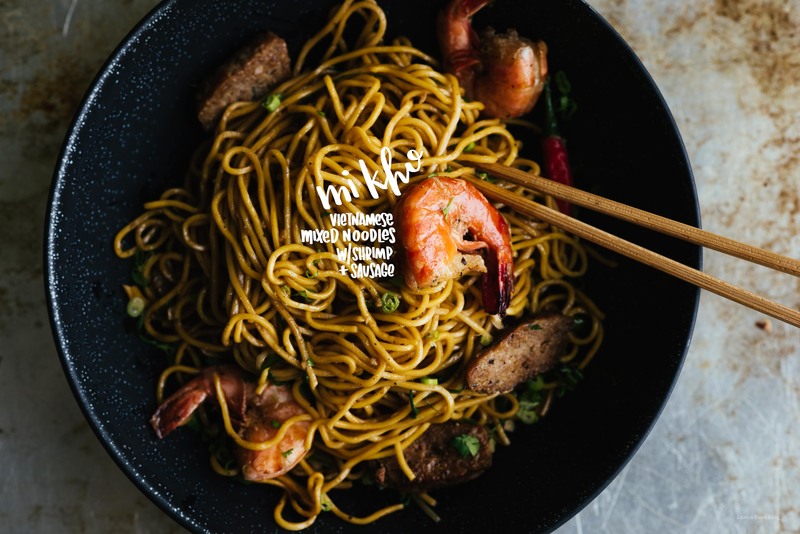 Some more recipe notes: Mi Kho is traditionally served with soup on the side, so I’ve included that optional step here, but feel free to omit – my mom never served soup. This recipe looks like the longest recipe on earth but it’s actually three recipes in one. Traditionally you make mi kho with Chinese BBQ pork, so this is my take on it where I’ve replaced the BBQ pork with an ambitious homemade nem nuong (most Vietnamese people would say you’re nuts for trying this at home). If you happen to have a source of Chinese BBQ pork nearby and don’t make the soup, this recipe can be made in about 15 minutes. In fact, you can replace the pork with any roast pork of your liking, it’ll probably taste great. Finally, you’ll notice this recipe is very garlic heavy and it’s all crushed. A garlic press is your friend here. Note: this recipe makes a lot of nem patties. Feel free to quarter, but you’ll be missing out. In a small pan, toast rice over medium heat. Once it has turned golden brown (about 3 mins), crush it into a fine powder with a mortar and pestle or spice grinder. Transfer to a small prep bowl and set aside. In another small prep bowl, mix the baking powder and water together until it foams a little. Add the crushed garlic paste, sugar, pepper, and 1 tablespoon of your roasted rice powder to your mortar and pestle and crush until your mixture becomes a paste, then add fish sauce and continue crushing until well mixed (this is done to minimize fish sauce splashage). Taste and adjust seasoning if needed. Finally, add oil and baking powder mixture and mix well. In a medium bowl, mix together ground pork and the seasoning paste in your mortar. Using the pestle, gently crush the ground pork and seasoning together for about 2 minutes, or until it becomes a smooth, evenly mixed texture. Wrap the bowl with plastic food wrap and refrigerate for at least 1 hour. You can leave this overnight as well. Fill a medium pot halfway with water and bring to a boil. If using bones, blanch your bones for 2 minutes, then remove, drain water, and wash your pot. Fill and bring up to a boil again, and add your blanched bones back in. If using a cut of pork instead of bones, cut your pork into 1″ cubes. Add your pork to the boiling water. Add extra water to cover the pork as needed, and allow to boil for 2 minutes, then reduce heat to low. Skim any scum from the surface of your soup with a spoon or soup skimmer. Try to keep your water temperature between 170F and 190F, or just below a simmer (no bubbles) if you don’t have a thermometer. Using as fine a dice as you can (we’re going for a fine brunoise), dice your shallots. Add shallots, garlic, pepper, and sugar to a mortar and pestle and crush into a paste, then add fish sauce. Taste and adjust seasoning, then cover and refrigerate. After 1-2 hours, your soup should be a very clear lightly golden brown color. Add your seasoning paste one tablespoon at a time until seasoned to your taste. After your nem mixture has been in the refrigerator for 1-2 hours, take it out and form into patties. If you are using another roast pork, skip this step and just add about 2 tablespoons of whatever liquid your pork comes with. Heat a large pan with 2 tablespoons of oil. Fry the meat over medium high heat until dark brown on both sides (or internal temp reaches 170F). Remove the patties and set aside on a cutting board or plate. Reduce the heat to medium and fry garlic and sugar until the garlic turns a light golden brown. Add remaining ingredients and deglaze the pan. Cook for one minute, then reserve sauce into a small bowl. Prep your squid if needed, as desired. Peel your shrimp, if desired. Set both aside. Slice your nem patties into 1/2″ strips. Slice chives into 3″ lengths. Heat your oil up in a large pan or wok. Add your nem and fry lightly, then add squid and shrimp. Cook until lightly tender, then add Mi Kho sauce. Remove from heat and add noodles and chives, then toss well. Serve topped with fried shallots. If you made the optional side soup, add a few sprigs of cilantro with the stems removed into some small bowls, and ladle the soup over them. Serve with the noodles. 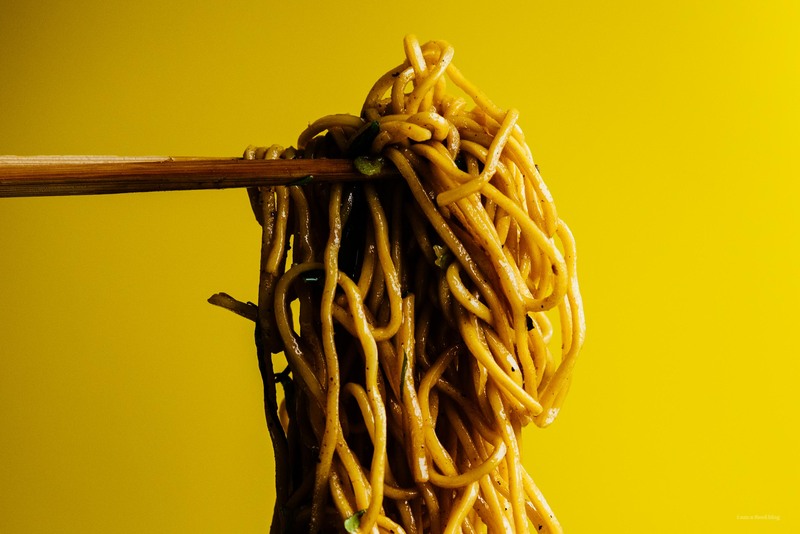 I mean, all noodles look good but these look GOOOOOOOOOD. That sticky sauce with prawns AND sausage?? Yes pls. You’re totally right by the way, skipping the mortar and pestle stage of any cuisine’s recipes does make it faster but really cuts down on flavour! What’s “our restaurant”? Super curious! 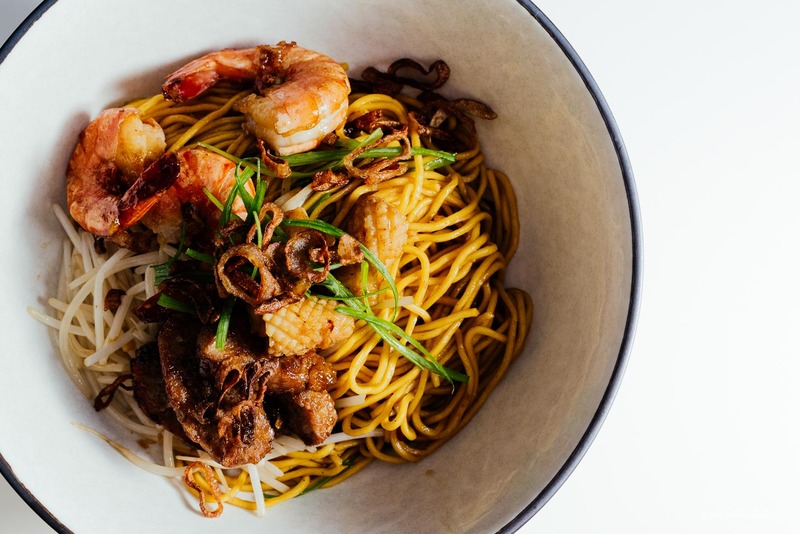 What type of noodles are you using for this dish? Mike, great recipe, great food, super photos! Reading your blog, we just had to go to Phnom Penh to have it. Stephanie is right, yours looks better. Anyway, we had a good afternoon. Thanks and Phnom Penh is never a mistake – hope you ordered some wings!